The Boeing 767 is considered a a mid-size, wide-body twinjet airliner developed and manufactured by Boeing Commercial Airplanes. It normal has a seating capacity for passengers between 181 and 375 and has a normal range of 5,200 to 6,590 nautical miles or 9,400 to 12,200. It has started operation in 1982. There were already one thousand thirty nine 767s ordered in which nine hundred seventy of them were delivered as of January 2009. 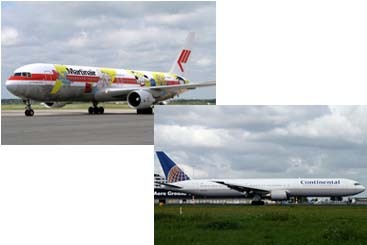 There are 48 airlines using this type of aircraft as of December, 2008.